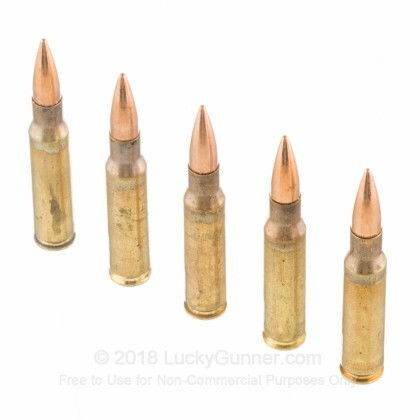 This 7.62 NATO ammunition from the Lake City Army Ammunition Plant (LCAAP) in Independence, Missouri is authentic mil spec ammo suitable for target shooting with M-14s, FALs, Remington 700s, and other rifles chambered in both 7.62 NATO and .308 Winchester. These cartridges follow the M80 standard. Mil spec ammo in this caliber is typically slightly less "hot" than hunting loads and makes for more pleasant shooting at the range! Each cartridge in this bulk case of 500 fires a 149 grain full metal jacket bullet at a muzzle velocity of 2,790 feet per second. This results in good medium to long range performance and an average level of felt recoil. Lake City ammo is made on the same production lines that supply the US military. It is typically excess production from government orders; many shooters favor LC ammo due to its military origin and high production quality. This ammo uses non corrosive Boxer primers. The reloadable brass cases are annealed (heat treated) for strength; the resulting discoloration of the brass is typically polished away on commercial cases. However, military ammo retains these markings as proof that the round has been constructed properly. Picked up for my M1A. Great for getting range time, zero malfunctions. Quality purchase! Received my first case 30 days ago. Great ammo for ringing steel at medium to long range. Consistently 1.25 to 1.50 MOA. Don't hesitate to buy this lot. I am ordering my 2nd case tonight. Hundreds of rounds throughout my M1A without a single issue. At current cost happy to stock and fire "liberally" at the range. Glad I listened to reviews. Bought 500 rounds of this stuff and ran 200 through my new Springfield M1A. Accurate and reliable. No problems. Highly recommend it . Lucky Gunners service and shipping was excellent. Also highly recommended. This ammunition doesn't disappoint. It works great in my sig 716 and is just as accurate as any normal factory ammunition. Its lake city and the stuff I got was only a couple years old ( based on brass head stamps). 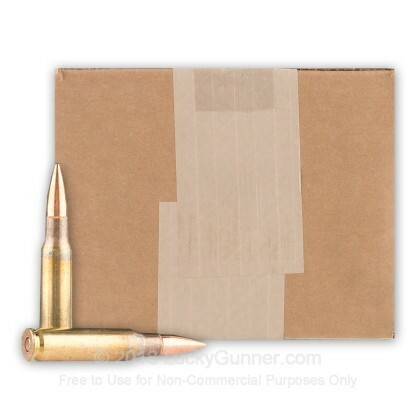 Sure it comes all piled in a bag and is dingy (it is surplus afterall), but when its accurate, works flawlessly, leaves you quality reloadable brass, and is a great price you can't pass this up. Worth noting that even though it shipped loose in a bag in a box it arrived undamaged. had to buy another one had so much fun two days at the shooting range went thru 400 rounds , the ammo shot flawlessly thru my m1a and my fr8, thank you Lucky Gunner for making it possible with your great prices , fast shipping , Cant go wrong military ammo great quality, great brass to reload. Just separated my order and it only contained 499 rounds. great ammo. 7.62x51 milled lc brass . This stuff is great, perfect for my m1a . I will be buying another one very soon . thank you very much, this is milled brass boxer primed . packaging was very good, and fast shipping . Thanks Lucky Gunner . My CZ 550 FSI .308 really shoots this ammo well. It's got a 20" 1:12 barrel and that wonderful CZ set trigger. I was particularly impressed with the consistency I got with this ammo, even better than other ammo that cost a lot more. Lucky Gunner's shipping was smooth. Thanks! This turned out to be really good stuff, head stamped LC 17 and the NATO cross. New brass. Well packed. Many happy experiences with Lucky Gunner too. 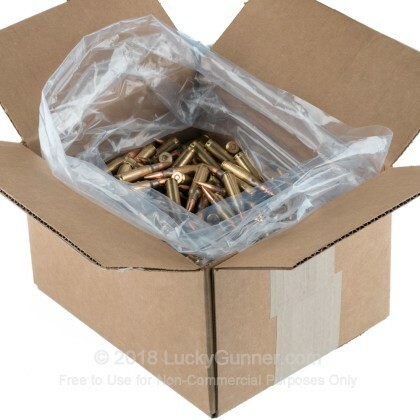 I just bought a box of this ammo to break in a new POF Revolution. expecting some gun issues and maybe ammo issues, I was amazed by both. First round of 80 was perfect and I look forward to many more. 200 rounds through my AR10 effortlessly. I love current brass for 52 cents and I even like the looks of it, but you should see the casings after corn cob in the cleaner. It's going to make pretty reloads. I'll probably buy another box at some point to keep a great rotating supply. Lake City ammunition is great quality. Shoot this ammo in my PTR-91's and Ruger SR-762's with no problems at all. Lucky Gunner is Awesome! My wife and I both shoot 308's, her's is a LR-308 and mine is a PTR-91. We shoot long range with the 308's and my wife will hit the steel targets at 500 yards and averaging 19 hits per 20 rounds shot. The targets are 8x11 and she shoots better than I do lol. Never have had any problems with around 2,000 round fired out of both of them. I decided to go with Lake City ammo after some disappointing results with some Winchester bulk ammo. This ammo isn't pretty to look at (edit: military grade annealing process not polished bright like consumer ammo), but functioned flawlessly in every rifle I tried, with very good accuracy. For the price I will buy again! Q: Are the cartridges reloadable? A: Hi Weston. 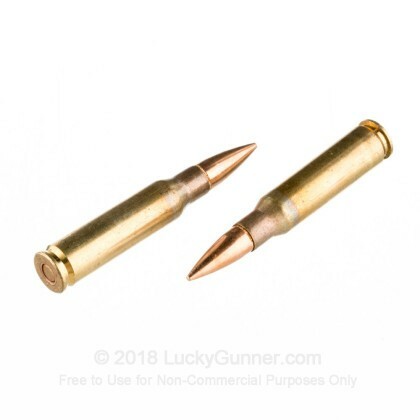 That LC ammo is a great bargain, especially considering that you can use the brass for reloading. Since the primers are crimped in, you will have to deburr the primer pocket, but that takes only seconds with each case and never has to be done again! Q: Are the projectiles for this ammunition flat-based or boat tail? Thanks. A: The M80 specification does not stipulate a boat tail projectile, so no these do no have it. Be on the lookout, though, for ammunition marked M80A1, as that does include a boat tail projectile. Q: Where is the ammo that doesnt attract a magnet? Cant find it anywhere, how are you supposed to go to a range and shoot if it always attracts a magnet and is illegal to use on ranges? A: You can shoot almost any .308 Winchester ammo safely at your range. The issue is not that it is illegal, but rather that the ranges don't want to use magnetic ammo since they have no way of knowing if the core of the bullet is steel (armor piercing) or, like the 7.62 NATO projectiles, they are only bi-metallic. 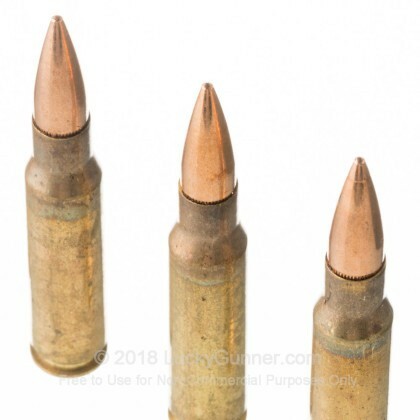 Unfortunately, almost all ammo sold as 7.62x51 NATO will be loaded to military specs and those specs call for a bi-metallic, magnetic bullet. Q: Are these steel-core rounds? A: Although they are lead core and not steel core, the jacketing is bi-metallic and will attract a magnet. Q: 1 Are the cases the heavier/thicker brass military cases or the lighter civilian Winchester/ Remington type cases? 2 Are the primers and bullets given a lacquer sealing? 3 Are the cases headstamped LCC with the year (say 99 or 03 or 12? Thanks so much!! A: These are the heavier mil spec cases. The primers and bullets should be sealed with lacquer as part of the mil spec cert process. The cases should be head stamped as all of the Lake City ammo is. Q: What is the ballistic coefficient on this round? I will be practicing some longer 800yd plus shots and would love the technical details on this ammo. A: The U.S. Army's Ballistic Research Laboratory measured a ballistic coefficient (G7 BC) of 0.200 and form factor (G7 i) of 1.105 for the M80 ball projectile. The casing, projectile and overall quality of this is standard range/battle use configuration. It is not well suited for precision longer range shooting. While it can be used of course, the performance will not be the same as a comparable "Match Grade" round. Q: Are they non corrosive? A: This ammo is not corrosive. Corrosive ammo is no longer produced in this country. Q: Are these reloads ? A: Hi! These are not reloads. They are typically excess from government over runs that are loaded at the Lake City Army Ammunition Plant in Independence Missouri. Q: Does this bullet attract a magnet, as in a partial steel jacket? A: These rounds are built to specification for standard M80 ball. This would include a steel based bi-metal jacket and would attract a magnet.